From time to time, we would like to provide you, our friends and supporters, a quick and easy to read snapshot of our recent and significant activities. Here is the first of these. POF is an example of where CCI has provided help. CCI has been supporting POF with financial assistance for nine years for their marvelous work to provide prosthetics to amputees and corrective measures for children with foot deformities in Asia and Africa. During this time, we have provided POF $21,500 for prosthetic limbs for thirty six children in Vietnam, and to help fund POF’s expanding club foot education and emergency surgery programs in Vietnam and Sierra Leon. On March 21, at POF’s annual dinner- auction fundraiser, where our clowns played with guests during the silent and live auctions and dinner, we presented Winfried Danke, POF’s Executive Director, our latest contribution of $4,500. 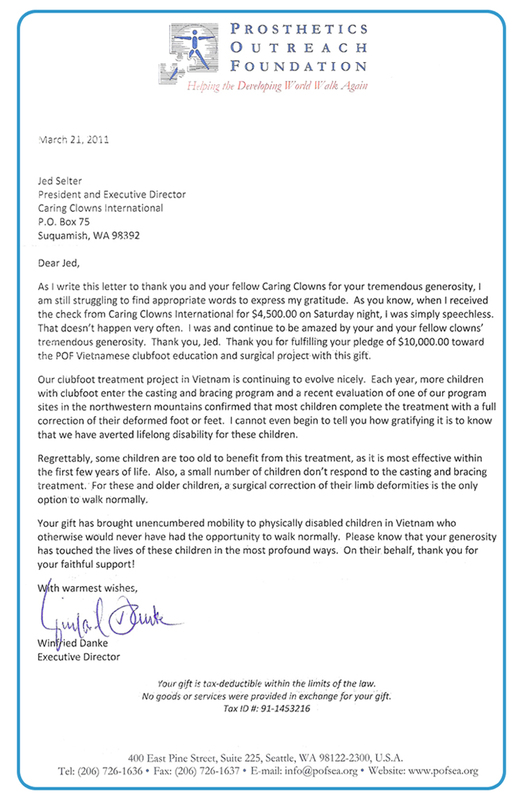 To give you an idea of the impact of your support to us, here is the letter Mr. Danke provided back to us after the event. Check in periodically to “Whaz Up! – News at a Glance” for the latest news about our goings-on! THANK YOU for all your continuing support! 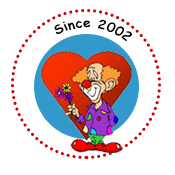 You may continue to contribute through our donate button on the site, or via mail- Caring Clowns International, P.O. Box 75, Suquamish, WA 98392. All Our Best to each of you!